Hope I'm not just dreaming this, but I'm sure somewhere in the city centre way back there used to be some white modern art type statues that were all curvy. Can't really describe them other than that! Not of people I recall, more just "something". In my head I thought they were near what was a glass police info box in the Precinct. Not lived in Coventry for 20 years now. Also anyone have a photo of a wall artwork that I have a feeling is inside the entrance of Broadgate House, but was once outside, maybe in a subway by the Godiva clock? You're right, we used to call them the 'Coventry Bums'. IIRC, they were fibreglass. There might be pictures of them buried away on this site, but there's certainly pictures of them being cleaned by two ladies on the Telegraph site. 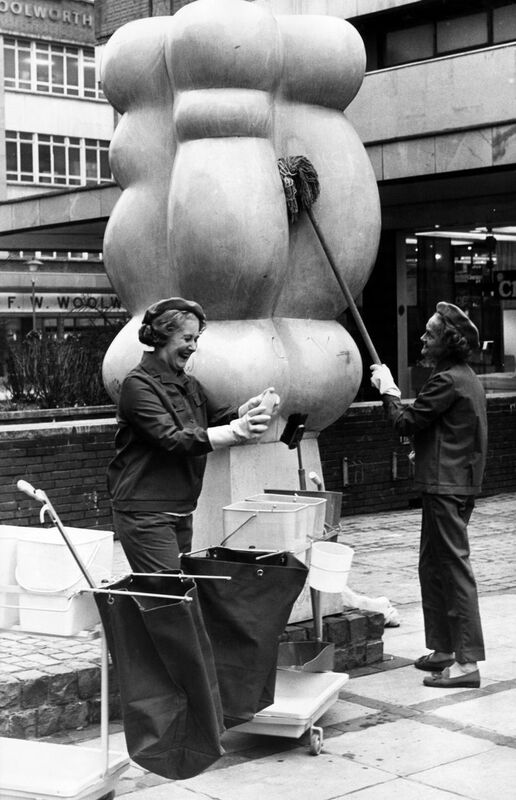 The folks who are running the Artspace at the Coventry Telegraph Building have recently inspected the Bums at a Council storage facility and hope to display them in the CET Building at some point. If you look at CET Building on Facebook, there was a post on December 21st. On 28th Jan 2018 4:50pm, bohica said: You're right, we used to call them the 'Coventry Bums'. IIRC, they were fibreglass. There might be pictures of them buried away on this site, but there's certainly pictures of them being cleaned by two ladies on the Telegraph site. Sorry bohica if my sense of humour is a bit "offish", but isn`t there some sort of joke between the first and last lines of your posting? The Ted Atkinson ‘family group’ Precinct art sculptures are still in storage thanks to our council - under the ring-road I think (I can confirm!) - thanks to my mate Alan Denyer who is involved with the CET building. They are hoping to have them displayed in the foyer there soon. Thank you all for replying, was great to see the pics and know the bums are still alive and well. Hope they get resurrected and put back somewhere on display. It's a shame that so much of what the Precinct stood for has been eroded away bit by bit by those who think they know what's best for the city. Like has been said before, the Luftwaffe flattened the city, but successive city planners have seemed hell bent on destroying parts of it too. The Broadgate of grass and cars was definitely the best it ever was. It should be returned to that without question.